The Satin Slippers perform on Broad Street during the Philadelphia Mummers Day Parade on New Year’s Day, January 1, 2016. Predictions for wind chills hovering around zero on New Year's Day have sparked a heated and emotional debate about a step the city hasn't considered in 11 years: postponing the Mummers Parade. Although such a decision typically is not made until the predawn hours Jan. 1, Mummers leaders and city officials have been discussing the possibility of moving the parade to the following weekend. "No way we could parade" with the temperatures in the teens and the wind chills in the single or negative digits, John Pignotti, president of the String Band Association, said Thursday. "Aside from cold weather, you have heavy winds here too." But city officials remain strongly opposed to the idea of postponing the annual tradition. 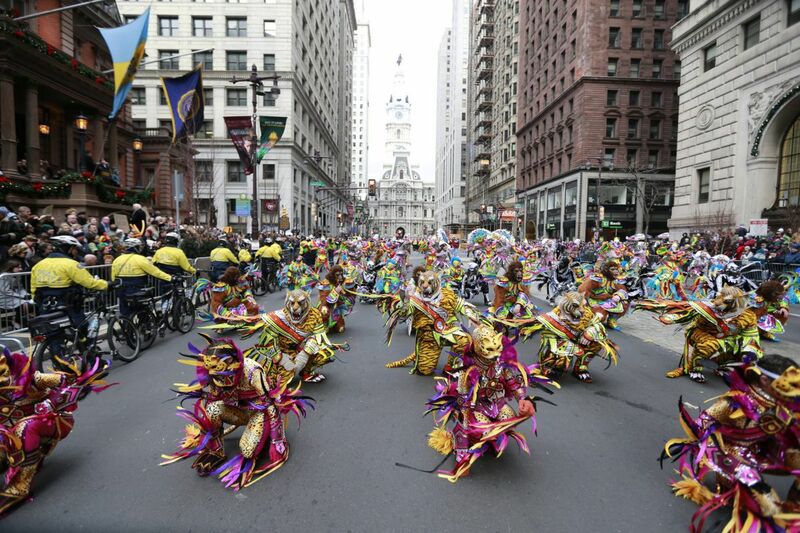 "As of right now, the parade is going to happen Monday, barring any freak storm," said Leo Dignam, an assistant managing director of the city government who is in charge of this year's Mummers Parade. The final decision, scheduled for noon Saturday, will come from the heads of the five Mummers divisions — string bands, fancy brigades, wench brigades, comic division, and fancy division — in conjunction with the city. Everyone gets a vote. "It's a hard decision," said Rich Porco, president of the comics division. "It's going to be a clear day, but it's going to be freezing." Porco said many Mummers were concerned about young and elderly marchers, and about the musical instruments. "The string bands are going to have one hell of a time with their instruments freezing up, especially the horns," he said, adding that the sound won't be as sharp and would affect the bands' competition. Pignotti added that banjo players can't wear gloves, and the strings would not sound the same in such temperatures. He also worries about the health of the spectators — those who go. "We want our fan base out there cheering us on," he said. "I don't know how many people will be out there with that kind of weather." Dignam said the city was doing everything possible to make sure the show goes on as scheduled. The two sides met Thursday. "There's not much of a precedent for stopping the parade because of low temperatures. We usually talk about postponements when it comes to rain, snow," Dignam said, adding that the city will provide 50 to 60 warming buses to the Mummers and allow them to travel the parade route. "They can take turns going in the buses to warm up," he said. There will also be five warming tents along the route. The public will have access to a government building at 1515 Arch St. and the restaurant at Dilworth Park as warming spots. Dignam said if the decision is to postpone, the parade would be held the following Saturday, Jan. 6. "It's a high of 25 next Saturday. So, pick your poison," Dignam said of Mummers who are advocating for the parade to be postponed. "You want to go out for 4 degrees? Especially when we are making these accommodations." Since the parade began in 1901, the event has been canceled only twice (in 1919 and 1934) and postponed 22 times — the last two times in 2007 and 2003, both because of rain. Porco said that in his 60 years of marching in the parade, he couldn't recall such a frigid forecast: Temperatures Monday morning are predicted to dip to a low of 12 degrees, with a wind chill that could drop to minus-2. The projected high that day will be 19, with a wind chill still only 7 degrees. Porco added that he would like to avoid a situation like one years ago when it began snowing once the parade started and the string bands had to jump on buses and perform in City Hall, as opposed to along the parade route. The traditional "weather vote" usually occurs around 4 a.m. on the day of the parade, via a conference call including the Mummers division presidents and city officials. A meteorologist is also on the line to give the most up-to-date forecast. But officials are hoping that the Saturday call is the final word. "True Mummers will go out in any weather," Porco said, but "you don't want to force anyone to do anything." Until a final call is made, Mummers groups are continuing to practice as if they're strutting on Broad Street in freezing weather Monday. About 8,000 Mummers are expected to participate in this year's parade. "I know the band I'm in, we're approaching it like we're in it [Monday]," said Joe Leso of the Polish American String Band. "We're practicing outside tonight." Editor's note: An earlier online version of this article incorrectly reported that the Mummers Parade was last postponed in 2003.